The 2018 Acura TLX and the 2018 Acura RLX are two popular car models that stand out in the industry for their sporty design and reliability. Both vehicles also include high-tech features that make for a comfortable and memorable ride while spending time on the road. Although the two luxury mid-size cars are similar with their design and performance, they do have a few different features to consider. 2018 Acura TLX's cabin comes standard with leatherette upholstery and a 10-way power-adjustable driver's seat. Heated and ventilated front seats and a leather steering wheel are additional features that increase the comfort of the interior setting. Those who choose the upgraded front sport seats can enjoy having more support. Plenty of head and legroom is also included, making it easier to take long drives in the vehicle. The 2018 Acura RLX seating is built with high contrast stitching and side bolstering. The model has four different colors to choose from with minimal wind/road noise. Two different display screens are provided on the dashboard, making it easy to navigate with the GPS that is provided or change the station on Sirius radio. 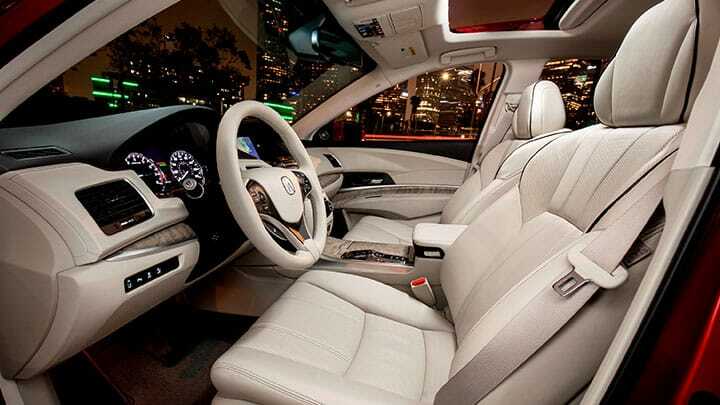 The regal materials and leather seats that are used create a chic and luxurious interior setting that is high-end. The Acura TLX is built with a myriad of safety features that reduce the risk of an accident while allowing you to maintain control of the car. Blind spot monitoring, lane keep assist, automatic emergency braking, and forward collision warning are useful to use while sitting in traffic or when driving in harsh weather conditions. It also received excellent ratings for side impact, roof strength, rear crash protection, and the moderate overlap front test. The Acura RLX offers a Traffic Jam Assist feature, which pairs lane-keeping assist with adaptive cruise control, works best on straight routes with slow-moving traffic. A surround-view camera and front and rear sensors will allow you to have an extra set of eyes while parking or driving in traffic. Additional safety features include a forward-collision warning, adaptive cruise control, and a blind-spot monitor. There is a generous list of standard vehicle options that are included in the 2018 Acura TLX. It includes an updated 4.2-inch display and infotainment system that is faster and easier to use with ApplePlay and Android Audio. Drivers can use the multi-angle rearview camera when backing up while taking advantage of hands-free text messaging and email. Pandora music streaming, a USB port, and a seven-speaker sound system will also enhance the quality of the ride while bumping music. GPS-linked climate control, wireless phone charging, and HD Radio with traffic information will all improve the driving experience. AcuraLink® is also included, which will make it easy to unlock your vehicle from your smartphone, view technical data, track the car if it's stolen, and even request roadside assistance. The Acura RLX is built with GPS-climate control to make it easy to stay warm or cool in the car depending on the outside weather conditions. Additional features include a moonroof, bluetooth phone connectivity and audio streaming, 14-speaker Krell premium sound system, rain-sensing windshield wipers, and a power rear sunshade. Contact our dealership to schedule a test drive of each model and see how they compare to one another. We'll explain the features that are included and can also discuss financing options that are available.